THE BRONX — Apartments renting for as little as $822 per month in a Concourse building will be up for grabs soon through the city's affordable housing lottery. The apartments are being built at 530 Exterior Street, a mixed-use, 13-story, 143,000-square-foot project on 149th Street, according to builders Monadnock Development LLC and Signature Urban Partners. Depending on the size of the household, rents for units will start at $822 and run up to $1,224. However, not everyone will be eligible to live at this new complex, since apartments are limited to people earning between $30,069 and $66,420. Applications opened up on Monday and run until Aug. 18, according to NYC Housing Connect, the portal for New Yorkers to apply for affordable housing projects around the city. 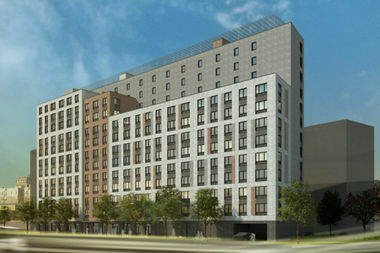 Priority is given to residents of Bronx Community 1, who will be able to get 50 percent of the units available. There are 19 studios, 53 one-bedrooms, 43 two-bedrooms, and nine three-bedroom units available in the building. Residents will be able to take in amenities like a fitness room, laundry room and outdoor recreational space. Odds are low that you will be able to get one of the affordable units, due to fierce competition. Tens of thousands of New Yorkers apply to new developments, whenever the lottery opens. Applicants can apply online on the housing connect website or send a self-addressed envelope to: c/o The Wavecrest Management Team, 87-14 116th Street, Richmond Hill, NY 11418. 530 Exterior is a low-income housing development. Developers received a tax credit for building the project. It is expected to be completed in December 2017.